Standing water is the bane of any commercial building owner. 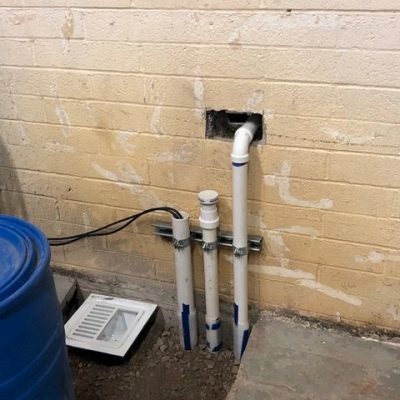 When no other options are available installing a sump pump can help keep water from accumulating. There are two types of sump pumps, named solely on how to locate them: the pedestal pump and the submersible pump. The one we are installing here is a submersible pump. It is called a submersible pump because it is installed under the floor to be flush with the underside of the flooring. We located the sump in the wash rackarea of the building. This sump pit (the blue basin shown here) is not elaborate but is made of every day plastic and is designed to surround the pump. As water levels rise to a certain level and fills the pit, the sump is triggered to start pumping. The water is then routed to a sewer ejectordrain to exit the building. As the water level drops, the sump automatically shuts off. This was the least expensive repair for this property owner. 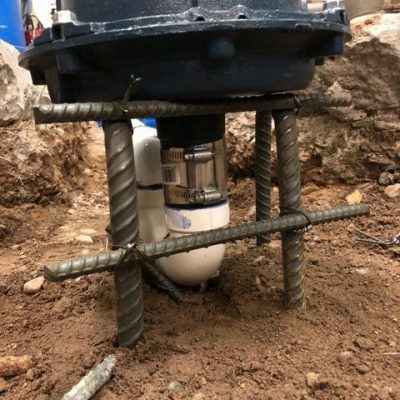 The advantages of a submersible sump pump are that they are quieter, cost effective, take up less room and are usually a good choice for living and working areas as they are well-protected by a concrete slab. The submersible sump is positioned in a hole where the lip of the plastic pit is level with the underside of the concrete. In many cases, a jackhammer will be required to get the depth necessary to house the pit and to handle any excess water drainage. Sump pit with drain lines coming into it, floor sink for future use. Vent line and ejector line run along wall to sewer main outside. 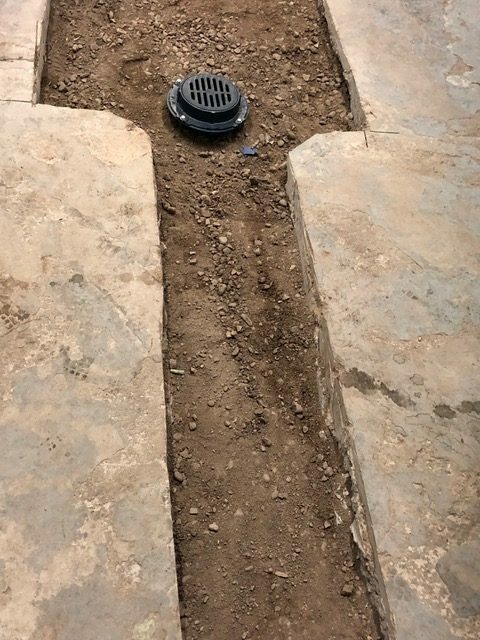 As depicted in the picture, the sump pits’ location is at least 10 inches away from the walls and the hole is deep enough to accommodate the depth of the pit and is lined with gravel for additional stability. 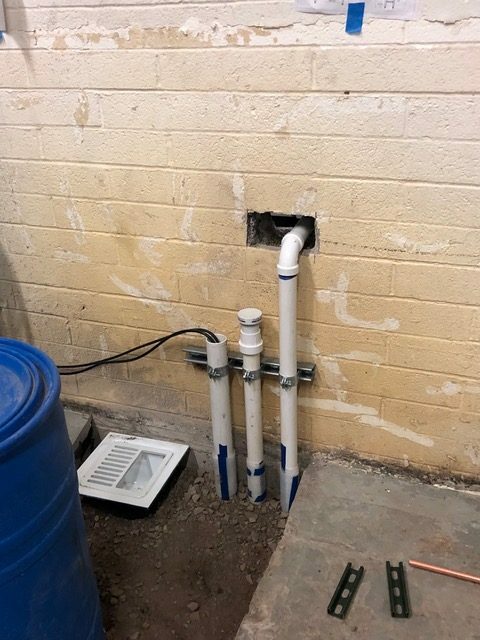 The three white PVC pipes coming out of the pit include, from left to right, drain lines, a vent line and an ejector line that runs along the wall to the sewer main that is outside. In order to keep the water flowing out and away from the building the PVC must be installed and secured properly. 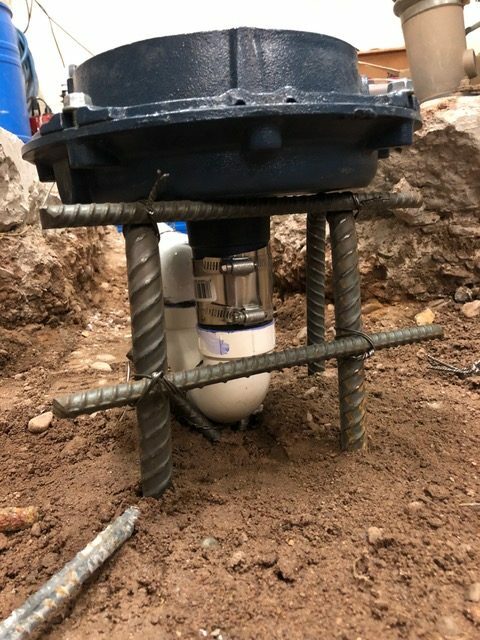 When done correctly, this thorough water re-routing system helps protect the buildings’ walls, floor and footings by keeping water away from the structure. The vent helps prevent an air lock from forming, ensuring water flow. The sink (the white square object on the far left) is an important part of the sump’s continued operation. It allows owners to pour water directly into the sumps’ pit to make sure the sump is still working. For future use all equipment can be indirectly wasted into floor sinks. 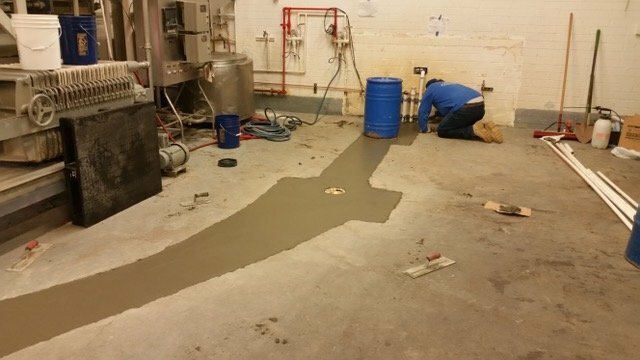 Once the plumbing is completely installed and tested it is ready to be secured by pouring the concrete. To keep the new floor looking good for years to come, the soil within the hole is tamped down firmly and then lined with steel rebar. Both actions will minimize future soil movement and help keep the concrete from buckling, pitting or cracking. The rebar set under the piping helps keep the pipe in its proper position, even while the concrete is being poured. 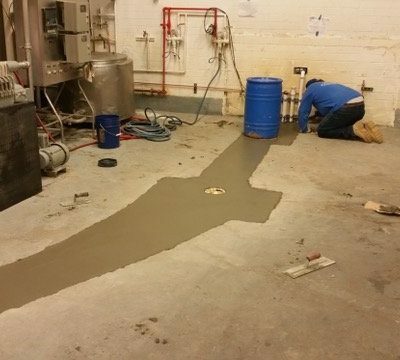 Later on, it will help minimize floor settling and work to support the new concrete. 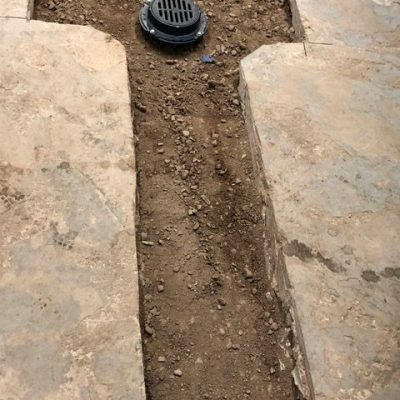 The all-new floor drain is positioned specifically to handle any potential sump pump failure, and can also handle overflow in the event of heavy rains or discharge. How to handle clogs. The first line of defense is a good offense by keeping the clogs from forming in the first place. You can do this in two ways. The first way is to avoid screened intake lines. The second way is to create a more robust design. AI the picture this sump pump is elevated on a platform at the bottom of the sump liner. This helps prevent clogs before they start. More may be better. 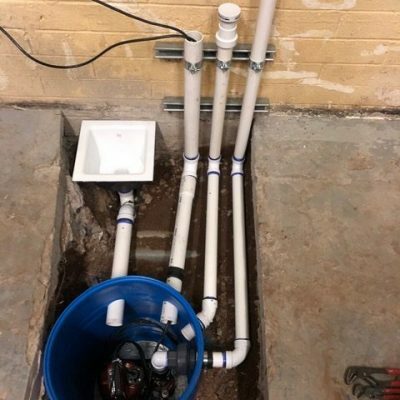 Installing one sump pump for a big building or a larger water accumulation problem may tax your one-pump sump and cause it to burn out more quickly. Have an expert evaluate how many pumps you will need to move your water out of your living or work space. Battery backup? When a storm knocks out the power, it typically means your sump will not work. Better systems have a battery backup that will run even when the power is out. Why insist on cast-iron motor housing? As you can see in the picture, the motor housing is made of cast iron. Typically, we recommend cast iron instead of the less expensive plastic because it tolerates and dissipates heat better than its plastic counterparts. That means you’ll have a longer-lasting motor and less overall expense. Keep your area dry by having City Wide Plumbing install your sump pump. 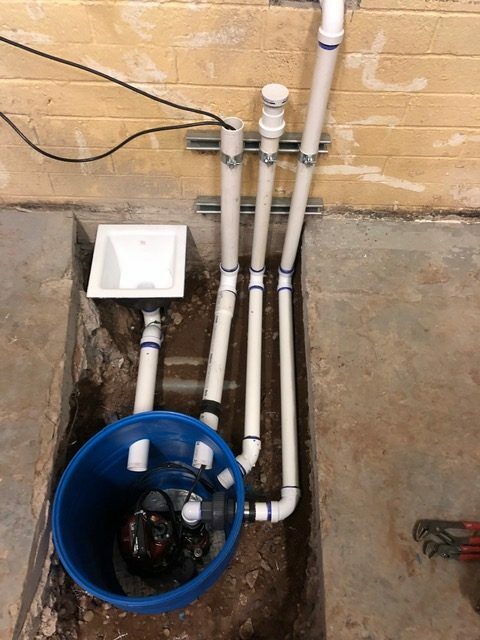 Their expertise means they will get it right the first time, have the right equipment and skills to handle the job and understand how to solve your water problems without the additional frustration. 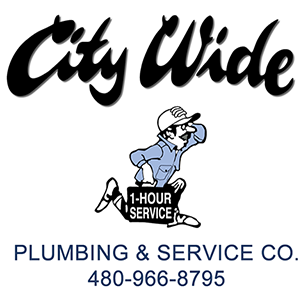 Call City Wide today! 770-872-0867. Taking a shower on-demand is one of life’s little pleasures. When the water temperature isn’t quite right, you want it fixed – quickly! 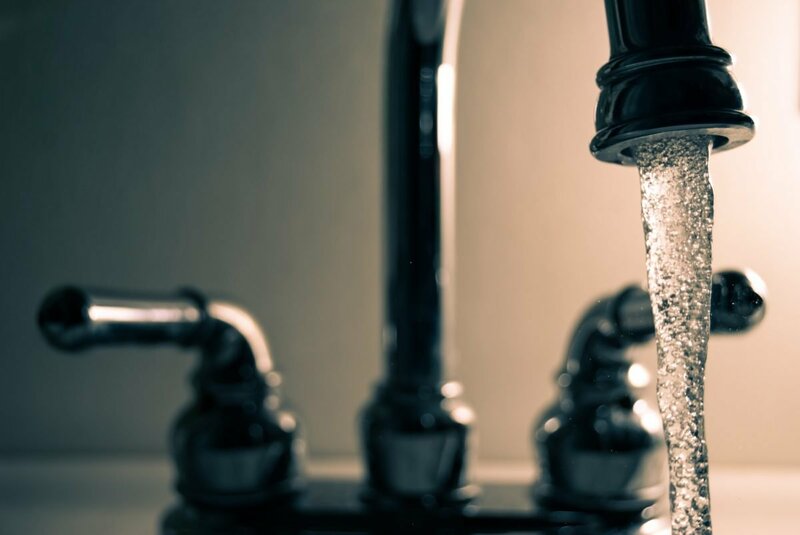 We have some tips for our residential Mesa, Ahwatukee, and Chandler customers to keep your water flowing, and to help preserve your daily routines. The average lifespan of your water heater’s tank is about 10 years, but you can help extend its longevity by draining the tank at least once a year. Make sure you have a garden hose handy – one that you can connect to the bottom of your tank and that’s long enough to reach a floor drain or another other exit point. A good rule to follow is that water flows downward much more easily, so you’ll want to position the hose’s end so that it’s lower than the tank’s drain point. Fasten an old nylon stocking over the end of your garden hose with a zip or wire twist tie, giving you an automatic filter. That way, any debris coming from the tank won’t clog your drain or soil your driveway. First and foremost, turn off the power that goes to the tank. If you have an electric water heater, you’ll want to shut off the breaker that controls the tank’s power source. If you have a gas water heater, you’ll want to use the gas shut-off valve that goes directly to the tank. The next step you’ll want to take is to shut off the water supply line. Typically, the water shut-off valve is located above the tank. At your closest sink, open up the hot water tap and let it run. It’ll help relieve the system pressure inside the tank. Clear the area around the tank before you open up the drain valve. The hot water from your tank is HOT! With the hose connected, open up the drain valve on the tank. When the valve is open, the hot water will drain out of the tank. Once the water is completely out of the tank, close the drain valve and then remove the garden hose. Turn the gas or electricity and your water supply line back on. Make sure you check how much sediment the nylon stocking caught. If it was a cup or more, flush your hot water tank more often than yearly. If it was about a tablespoon’s worth, then once a year will probably be often enough. Keep your tank’s temperature down to 120 degrees Fahrenheit. A lower temperature helps preserve the life of your tank, saves on your energy costs and helps prevent scalding accidents. It’ll also help you to prevent mold and bacterial growth in the tank – a great way to maintain your home’s water quality. To save energy, use the “Vacation Setting” when you leave for an extended visit. The pilot light stays lit but the water won’t heat. Check the area around your water heater and keep the floor around it clean. You’ll be able to detect excessive rust or other debris buildup in the area that can indicate potential problems. When water quality is also a concern, you have some options. You can install a whole-house filtration system that filters your water as it comes into the house. That way, you can be assured that the water reaching your water heater is clean, filtered and, by the time it reaches your taps, good tasting. The other added advantage is that it can help extend the life of your appliances, including your water heater, but also a dishwasher or clothes washer, for example. A filter removes these elements before they can damage your appliances. A whole house water filter can also pair with a water softener, so double check to make sure you have hard water before you add a softener. A water softener dramatically reduces visible spots and your need for heavy detergents when washing dishes and clothes. 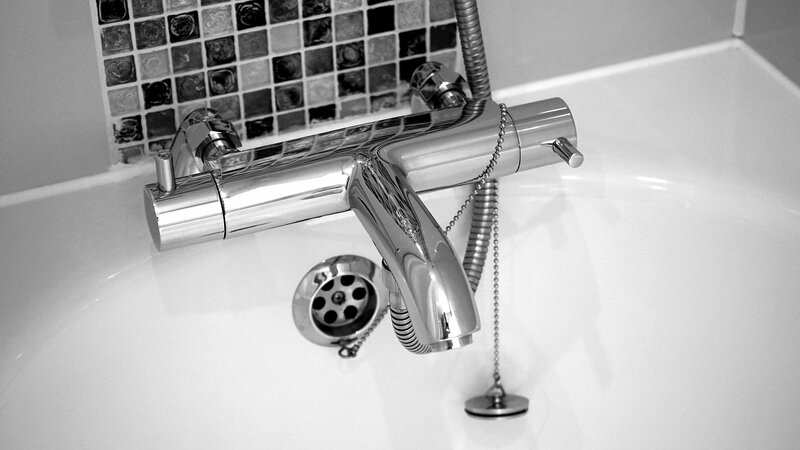 A water softener can also help preserve the life of your plumbing and fixtures. It removes the calcium, iron and other deposits that clog pipes and appliances. A water softener helps keep your washer, dishwasher, faucets, shower-heads and toilets running cleanly and smoothly for longer periods of time. Improves taste, odor and appearance of your water, straight from the tap. Removes pollutants by flushing them away and does not collect them. Uses the latest technology to purify your water. Gives you quality water for pennies per gallon. 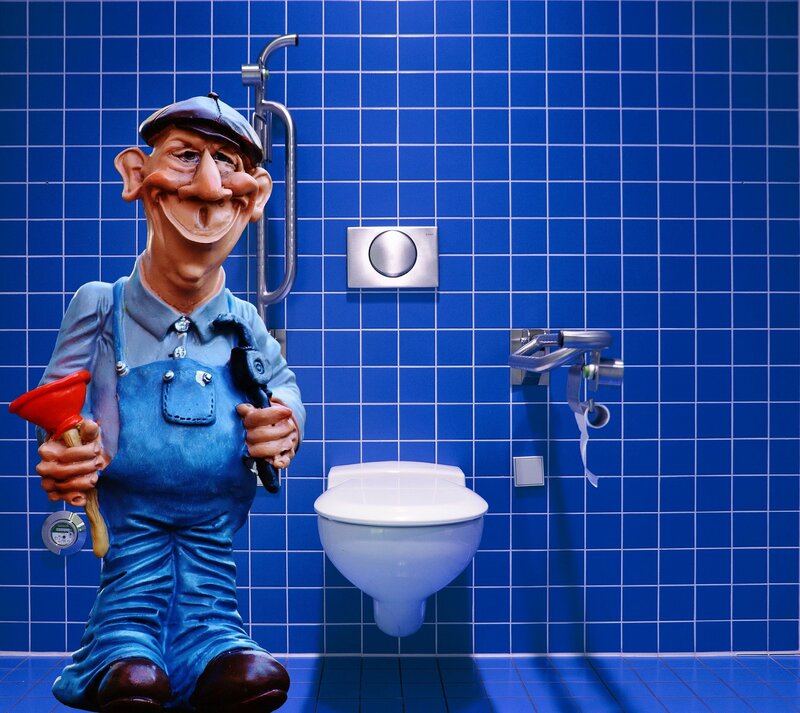 As plumbers, we go with the flow…and our goal is to improve yours for a better peace of mind. 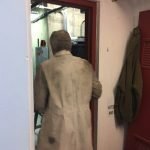 We’ve been in the water heater tank maintenance and replacement business for a lot of years, and yet there are still some jobs that surprise us. We went on what we thought was a typical call. A water heater wasn’t working properly, so we made a service call to determine the problem. In many instances, it’s because a water heater’s life expectancy is only 10-15 years, and when it’s on the older side of that range, it’s probably time to consider replacement. The new homeowner said that the water heater had already been there when she moved in, but according to the paperwork from the sale, it wasn’t quite 10 years old and it was a pretty heavy-duty brand. We didn’t automatically assume that she’d need a new one, but just to be on the safe side, we loaded a replacement into our truck before we made the call. When we got there and took a close look at what was happening – we drained the tank a little and noticed a great deal of brackish water coming from the spigot – we realized that she was probably in need of that brand-new water heater after all. In most cases, a water heater replacement is a matter of draining the old one, pulling it out and then dropping in the new one. It’s simply a part of the job, and usually a very textbook installation. 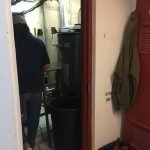 Everything was going along as planned – we’d turned off the gas and disconnected all of the plumbing – until we realized the doorway width was smaller than the tank’s circumference. 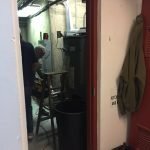 How were we going to get the old water heater out of the mechanical room? It must’ve been built around the tank! Knocking down a wall wasn’t an option, so we had to get creative. And that creativity involved cutting the water heater into smaller pieces that would fit through the doorway. What guy doesn’t like breaking out the heavy-duty power tools? As much as we wanted to use the SawzAll, a reciprocating saw that will slice through almost anything like butter, we had to be smart about where we cut the water heater to minimize mess and keep the destruction to a minimum. Instead of the giant saw, we chose a smaller, handheld metal cutter and carefully cut around the bottom of the tank. It was a strategic location that housed both the anodes (heating elements that heat the water) and a lot of the valves that allow water in and out of the tank. After cutting midway through the tank, our safety glasses firmly in place (thankfully with all of those sparks flying) and that shrill metal-on-metal sound piercing through our ear protection, we realized we may be able to shorten the time and see more of where we cut if we removed part of the outer shell first, and then cut through the anodes. original to the tank. They’d never been swapped out. The more corrosion we revealed, the more amazed we were that this tank had lasted as long as it did. It was a painstaking process, but one that had to be done. Eventually, we cut the tank into smaller pieces and moved them out to make room for the brand-new water heater. a. Turn the tank’s electricity or gas off first. Then turn off the water supply to the tank. b. Let the water in the tank cool for about an hour, and then drain the tank until it’s empty. 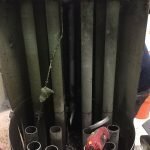 It’s a good idea to use a screened drain for this, as rust particles and other sediment can collect and form larger particles that can clog smaller pipes. c. Turn the water supply back on and refill the tank about half way. Drain it again to remove any lingering sediment. e. Turn the gas or electricity to the tank back on. f. You may want to consider investing in a water conditioner that will help soften hard water. You’ll get a number of benefits in addition to preserving your water heater. Check your thermostat. If it’s set higher than 120 degrees, then you may want to nudge it down to 120.
a. A lower temperature helps preserve the life of your tank, saves on your energy costs and helps prevent scalding accidents. b. Keep it at 120 or higher to prevent mold and bacterial growth. c. Use the “Vacation Setting” when you leave for an extended visit. The pilot light stays lit but the water won’t heat. You’ll save money on energy. Check the area around your water heater and keep the floor around it clean. That way, you can immediately detect excessive rust or other debris buildup that can indicate potential problems. 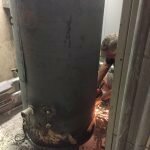 Although there wasn’t anything textbook about this water heater installation, we made sure the job was done right. Also, the new tank fits through the doorway. We made sure of that. The U.S. Consumer Product Safety Commission is recalling more than 616,000 of its natural and propane gas-powered water heaters made by A. O. Smith. The recall is due to a fire hazard risk when the units are installed on a wood or combustible surface. Residential Ultra-Low NOx Water Heaters Manufactured Between April 2011 and August 2016 were sold under the brand names America, A. O. Smith, Kenmore, Reliance, State, U.S. Craftmaster, and Whirlpool. Thirty-Gallon A. O. Smith brand Model G6-UT3030NV: If you purchased an A. O. Smith brand G6-UT3030NV thirty gallon water heater at a California Lowe’s Home improvement Store between the dates of February 1, 2018, and April 9, 2018. To see if you are at risk, check to see if your water heater has the first four digit serial numbers between 1115 and 1631. (They represent the year and week of production.) The serial number can be found on a rating plate located near the bottom of the heater’s outer jacket. Check the serial number on the website WaterHeaterRecall.com. If yours is included and it’s in use, you will need to turn it off immediately. Contact A. O. Smith at 866-880-4661 to see if your unit qualifies for a free repair. If you are not sure or need help, Give us a call! We’re here to help! Now that’s a headline to grab your attention! We’re sorry it’s also a true headline. There were 23 injuries reported and everyone’s safety is serious business. Please take notice of the recall. Hazard: The system can burst at or near the vessel weld seam releasing stored pressure. This pressure can lift the tank lid and shatter the tank, posing impact and laceration hazards to consumers and property damage. Consumers should immediately stop using the recalled Flushmate II 501-B systems, turn off the water supply to the unit and flush the toilet to release the internal pressure. Consumers should contact Flushmate to request a free Flushmate replacement unit and installation by a technician. 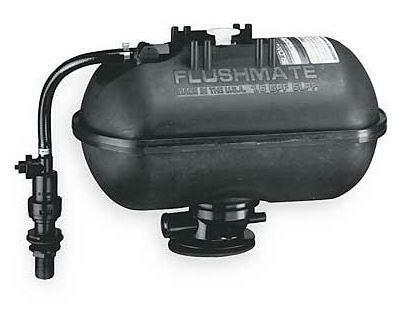 Consumers should contact Flushmate to request a free Flushmate replacement unit and installation by a technician. You can reach Flushmate toll-free at 844-621-7538 between 8 a.m. and 10 p.m. ET Monday through Friday and between 8 a.m. and 6:30 p.m. ET Saturday, or online at www.flushmate.com and click on “501-B Recall” in the blue box on the top of the page for more information.